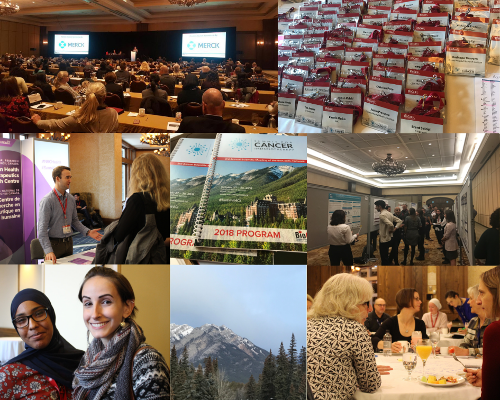 Beautiful Banff, Alberta, was the setting for the third annual scientific conference of BioCanRx – Canada’s Immunotherapy Network. The Summit for Cancer Immunotherapy (Summit4CI) gathered more than 300 leading scientists, clinicians, trainees and economists with representatives from industry, patient groups, charities and government from October 27-30, 2018. Summit 4CI explored the latest progress in cancer immunotherapy from scientific, clinical, industry and patient perspectives, through internationally recognized speakers, scientific presentations, poster sessions, panel discussions and networking. The Scientific Programming Committee organized a dynamic agenda and a stellar group of internationally recognized speakers. Plenary topics ranged from Tackling Challenges in CAR T and Engineered T cells to Emerging approaches to enhancing translational research: Innovative design and patient involvement. The Summit meeting helped to foster partnerships and the exchange of ideas for advancing next-generation treatments. “Everyone talks about their ideas, shares their thinking and data so this gathering is critical for advancing the field in Canada,” said Dr. John Bell, Scientific Director of BioCanRx and Senior Scientist, Cancer Therapeutics Program at the Ottawa Hospital Research Institute. A highlight of the conference was a talk by Canadian patient representative, Stefany Dupont. Stefany shared her story of receiving CAR-T cell therapy for acute lymphoblastic leukemia at the Children’s Hospital of Philadelphia. She is now in remission. Stefany commented: “I am here to advocate for CAR-T cell therapy and immunotherapy in general. It is my wish that in the near future, patients around the world don’t have to resort to treatment in the States to get their life saved.” She is advocating for more access to CAR-T therapy here in Canada. In addition, BioCanRx’s trainees took part in an HQP Development Day supported by Merck. Learn more about this year’s HQP Summit activities. After a very successful pilot program at the 2017 Summit, The Learning Institute (LI) returned this year. BioCanRx’s Cancer Stakeholder Alliance LI Working Group and members of BioCanRx’s HQP, developed a program to bring together leaders from the oncology patient community and academics from the immunotherapy research community. Participants attended all plenaries, engaged in knowledge exchange activities and a Patient-Researcher Roundtable event. Learn more about the LI. A big thank you to all of our Summit4CI sponsors. Industry support is key to making the Summit happen! Thanks also for the hard work of the Scientific Program Committee, HQP Working Group, all of the organizers and speakers. Many thanks to everyone who participated! We hope you’ll mark your calendars now and join us October 20 to 23, 2019 for the next Summit4CI in Victoria, BC!